The coach said his mind was made up "somewhere in between the minestrone soup and the red fish." Great decisions go with great meals. If this detail of the story were in a novel set in New Orleans, it would be dismissed as too outlandish. 1. They went out and got Drew Brees, the best available experienced QB in the National Football League. Our New Orleans Saints are clearly being forward-looking people of vision. Meanwhile, congratulations to Kenner residents for kicking out an incumbent as mayor and enthusiastically selecting Mr. Muniz, a Kenner man with a clear love of New Orleans and a history in Mid-City and with the Fair Grounds. Ashley writes the screenplay, using material like this. Oyster is the producer, getting Gina Gershon, Halle Berry, or Hoda Kotb as my, um, costar. Humid Haney is the production supervisor, giving the film a cool sensibility and dealing with the technical stuff. Berto, with his fine yellow jumpsuit, manages the crew. And, if we can muster his salary, we get Murph to direct. I voted early (that's not what I'm confessing). Anyway, on the way to get in line down at City Hall, I passed the City Hall Snack Bar. 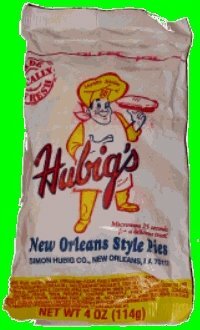 When I saw the box of neatly arranged Hubig's Pies on the counter, I stopped and got in line. No Sweet Potato, so I bought a Peach Pie and a Lipton's Iced Tea with Lemon. Fueled by my snack, I moved easily through the line to vote and got to the moment of truth. Confession One: I had put a Stacy Head sign in my yard. I had gone to a meet-the-candidate thing and was convinced that she is honest and had the best chance to beat Gill Pratt, which is extremely important to me. Even though I have great sympathy with the anti-Head sentiments of many of my fellow NOLA bloggers, I was probably going to vote for her. So Ashley, Humid Haney, et al: I had a Stacy Head sign in my yard (and still do). Confession Two: Despite the presence of the Head sign in my yard, I liked the candidacies of Shane Landy and Marshall Truehill very much. And then there was Quentin Brown, the "lawcare" (sic) specialist--he of the "No More B.S. "; on Nagin's Chocolate City comment "That was pitiful," etc. Anyway, maybe it was the Peach Pie, but a lot of my Katrina anger came out. I voted for Quentin Brown. There. I admit it. Anyway, I'm glad I did. And now Mr. Brown has endorsed Stacy Head. "It took San Francisco something like 20 years to fully recover" from the 1906 earthquake, said Mary C. Comerio . . .
"Maybe New Orleans will astound everyone, but I wouldn't be honest if I said the prospects were overwhelmingly good for New Orleans coming back anything like its old self," said Joel Kotkin . . .
New Orleans, by contrast, was approaching 300 years old when Katrina struck; it was a city that might be compared to a once glorious mansion occupied by a few generations of descendants who could not quite handle the cost of upkeep. "New Orleans was a city that was in its dotage when disaster struck," Mr. Kotkin said. "It was a city that had been in decline for decades."
. . . What Mr. Kotkin described as an "absence of upward energy" could prove critical as New Orleans slogs through a recovery that promises to take years. "I'm not sure we'll see the same level of investment in New Orleans," he said.
. . . And now, just as 1906 forever changed perceptions of San Francisco, so, too, will the indelible images of a city sitting under water play a factor as the city seeks new investments to make up for all those businesses that fled the city or simply shuttered their doors for good — and all those residents who are too old or too poor to return or simply see better opportunities elsewhere. "I think this all adds up to terribly bad news for New Orleans," Ms. Comerio of Berkeley said. "I look into the future and see a city half its size." Some of these assessments (if not the prediction) ring true, and I'm a diehard Orleanian committed to a resurrection here. A move toward a new future requires a clear-eyed look at what we have become. The New Orleans we became was shaped in part by the kind of people Humid Haney is going after here. The money people in New Orleans often have discharged their civic responsibility (in their own minds) by having parades and balls and putting on nice parties for their daughters when they reach a certain age. That's all nice, and some of it has even done a lot of good for all of us (the parades), but that's not discharging one's civic responsibility. Taking a risk on a surprising entrepreneur, keeping your investments local as much as possible, mentoring locals who want to learn how to make good--those are all part of being a citizen, a New Orleanian. And one should do all that for anybody who has character and is willing to work hard--not just the people in your social crowd or your kids or their friends from Newman and Country Day and Jesuit. The money people here are not known for reaching out with their investment money. However, I think we're losing some other folks too. We're losing the caller I heard ranting on WWL radio a few months ago, a lawyer from Lakeview whose house got wiped out. He ended up in Tennesee, and his bitterness toward New Orleans was dripping out of my radio speakers. He just couldn't get over the fact that now that he had been out of New Orleans for the first time, he realized how bad the city was and how great Tennessee was. I'm glad he's found a place he likes, and I'm sorry that he didn't get the chance to live elsewhere before. I don't understand the hate that he leaves here with. I think he's been harboring that for awhile, and I'm sure the city's been suffering as a result of his and others' ill will. That guy and his hate are gone. (Maybe his hate will go away, and he'll become a happy person in Tennessee. I hope so.) While I'm sorry his house got wiped out, I've got to believe that we're better off in NOLA with people who really want to be here and people who really want to move here. I think the flood forced some haters (poor, middle class, and rich) to move on. That's probably good for them and for us who are trying to stay. Now, I hope the flood will cause some money people in New Orleans to take some risks. And I'm not talking about risking money on Ron Forman's campaign. I'm talking about growing local industry--biotech, computer people, creative types. You know, the kind of people Humid Haney is and is always on about. This is the time when those of us who break the stereotype need to take charge. We need to lean on money people, here and elsewhere, to risk and invest here. We need to develop our abilities, create things, try new endeavors. We need to give money people some things worth investing in, and a political system that is accommodating of risk even as it provides a solid safety net for those who have temporary setbacks. This is a ramble, ain't it? Midwestern Cartoonists Are Just So Darn Funny! Keen! 1. This is a cartoon by a professional. I expect professional humorists to be funnier and more creative than I am. 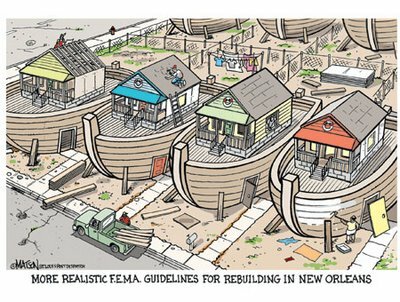 Just about everybody in New Orleans and any other coastal area in the world has already thought of something like this. I remember thinking about this kind of thing when I was 13. This guy Matson gets paid to come up with THIS? 2. Humor is very source-dependent. This cartoon, if drawn by an 11-year-old New Orleanian, might be worth a grin. Chris Rock can tell jokes about black people, and it's funny. David Duke can't. Woody Allen can tell Jewish jokes and be hilarious. Al-Qaeda members can't. The Midwestern lifestyle is, simply put, a lethal threat to us. People who are lethal threats aren't funny. Also, St. Louis is home to Tim Kusky, who wants us to surrender. Thanks, St. Louis! 3. 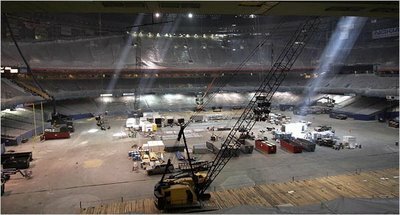 St. Louis has put $2 billion worth of new construction on land that was inundated in the flood of 1993. And now they want to lecture us on whether and how to rebuild. Priceless. Again, I'm not offended by this. It doesn't hurt my feelings. I'm just amazed that a hack gets to have his work published by a major metropolitan newspaper, and I'm bothered that misinformation (The Big Lie, as documented by Third Battle) gets reinforced so frequently. Two pix in this gallery. Rebuilding New Orleans One Act of Silliness At a Time. 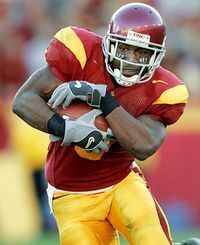 BTW, Lee de Fleur ran the whole route, finishing in approximately 1:04. Thank goodness no Kenyans wore large, foam-rubber NOLA symbols. All that said, the fuzzy table below (can somebody help me do this table right? An export from Excel looks really bad) indicates my ratings. Thus, there is now a Virginia Boulet sign in my front yard. I went to a Boulet event tonight at some friends' house, and I left even more convinced that she's the person for the job. The Times-Picayune has endorsed a majority of the sitting City Council members. This is a shocking and deeply disappointing development. Katrina and its aftermath have caused or revealed your newspaper to be something of which New Orleans can be proud. Why, then, would you revert to Stone Age politics by endorsing four of the seven sitting City Council members? The sitting Council is part of what got us to where we were. We don’t want a majority voice for incompetence and shortsightedness anymore. Since the storm, every single council member has been an embarrassment in some way. Remember: when the city was still trying to get basic services up, these people took time to endorse a particular candidate for general manager of the Saints. Mr. Batt and Mrs. Clarkson in particular have displayed reprehensible “not in my backyard” characteristics. Ms. Hedge Morrell has endorsed a head-in-the-sand approach to how our neighborhoods ought to rebuild. Please: anybody but the incumbents, except maybe Oliver Thomas. I registered online for the Crescent City Classic today. They asked for my estimated time, but they didn't ask for the estimated wingspan of my costume. Guess it's legal. Still determining if I will make the run as myself or as Lee de Fleur. Does anybody out there have experience running a 6.2 mile race in a large foam rubber getup? I need to know if it's feasible on a day expected to be about 84 degrees. I'm pretty sure it's quite doable. I'm in as good a running shape as I've been in a while. There are some World Class candidates running for office in New Orleans for this election season. Taking the ABIEMO approach, New Orleans can end up with a clean slate and some very capable people in a variety of offices. In other news, I received this expensive-looking piece of mail yesterday from a candidate for assessor in my area. Oyster, all I can say to you is that you left the field wide open for things like this. Some 25 years ago during a very difficult financial period while selling Real Estate and attending Loyola University I worked part timeat The Academy of the Sacred Heart*. During that brief time an intimate relationship was established and they came to know the real person that I am. Before leaving a personal letter of recommendation was written. On ther back of this card is a copy for your consideration. Needless to say my love of the Rosary continues to this day and I shall cherish those memories forever. 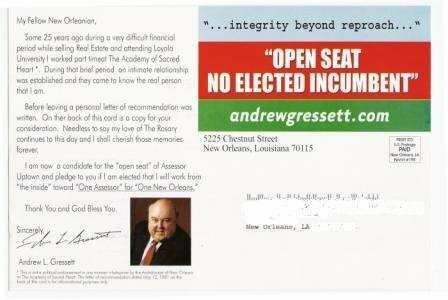 I am now a candidate for the "open seat" of Assessor Uptown and pledge to you if I am elected that I will work from "the inside" toward "One Assessor" for "One New Orleans." *This is not a political endorsement in any manner whatsoever by the Archdiocese of New Orleans or The Academy of the Sacred Heart. The letter of recommendation dated May 12, 1981 on the back of this card is for informational purposes only. I am very happy to recommend [name of candidate]. From the first day he joined us he has become a very important part of our community. Andrew is extremely personable, very reliable and his integrity is beyond reproach. 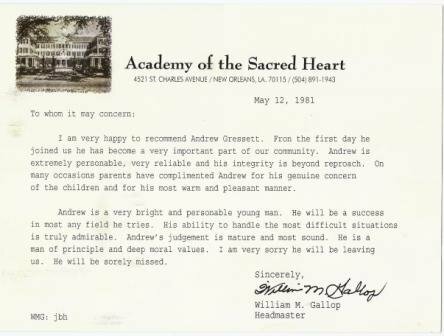 On many occasions parents have complimented Andrew for his genuine concern of the children and for his most warm and pleasant manner. Andrew is a very bright and personable young man. He will be a success in most any field he tries. His ability to handle the most difficult situations is truly admirable. Andrew's judgement is mature and most sound. He is a man of priniciple and deep moral values. I am very sorry he will be leaving us. He will be sorely missed. Gavin Mahlie died Tuesday morning. If you've seen a play in New Orleans in the past 15 years, there's a good chance he was in it. I've seen him in countless plays as part of Tulane's Shakespeare Festival. I'm stunned. I met him very briefly a couple of times. I didn't realize how important he was in my cultural mindscape until the story and his picture jumped out of the Metro of the T-P today and slugged me in the face. He and I were at Loyola at the same time in the mid-1980s. Didn't know him then. 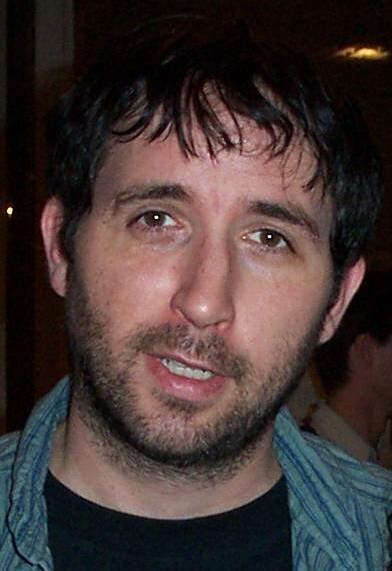 I loved this man's work. He and folks like Tony Molina played beautifully off of one another in so many plays I saw. I don't know what to say. This is a loss. This is a loss. I know that part of life is loss and death, but when is the pendulum going to swing back in NOLA and get us some serious, joy-filled life again? With the announcement of the closure of Smith & Wollensky and the prospective reopenings of the Crescent City Steakhouse and Charlie's, the steakhouse future of New Orleans looks bright. Now that we have rid ourselves of mediocrities like Ruth's Chris and Smith & Wollensky, NOLA's beef lovers will be able to dine on sheer excellence, undistracted by corporate interlopers interested not in quality but in uniformity. As Ashley says, Sinn Fein, baby. Sinn Fein.